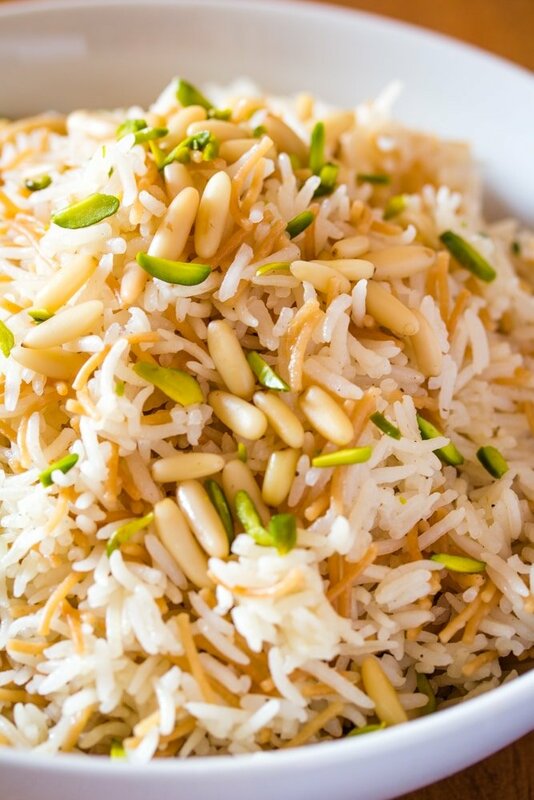 Lebanese Rice Pilaf with Vermicelli is a simple three ingredient Middle Eastern staple that is made with vermicelli pasta, basmati rice and cooked in butter or olive oil. If you love Middle Eastern cuisine you’ll love this Falafel recipe, Greek Salad and Baked Greek Chicken & Oregano Rice. So after last week’s detailed recipe of spicy Haleem, I decided to post an easy yet equally delicious Middle Eastern staple side dish called Lebanese Rice Pilaf with Vermicelli. 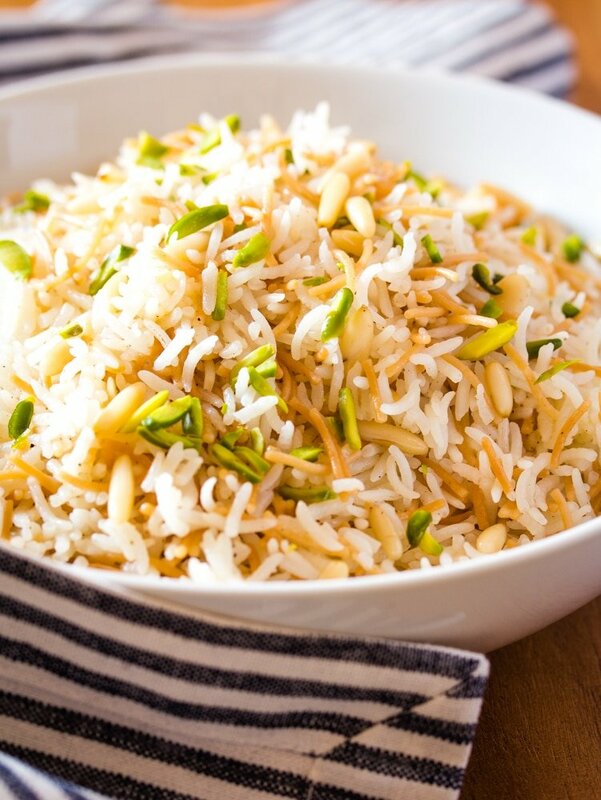 Living in the Middle East for the past five years, I’ve been able to discover a lot of delicious Middle Eastern recipes, and this Lebanese Rice is one of my favorites. I first discovered it at a Turkish restaurant, and it was instant love at first taste. 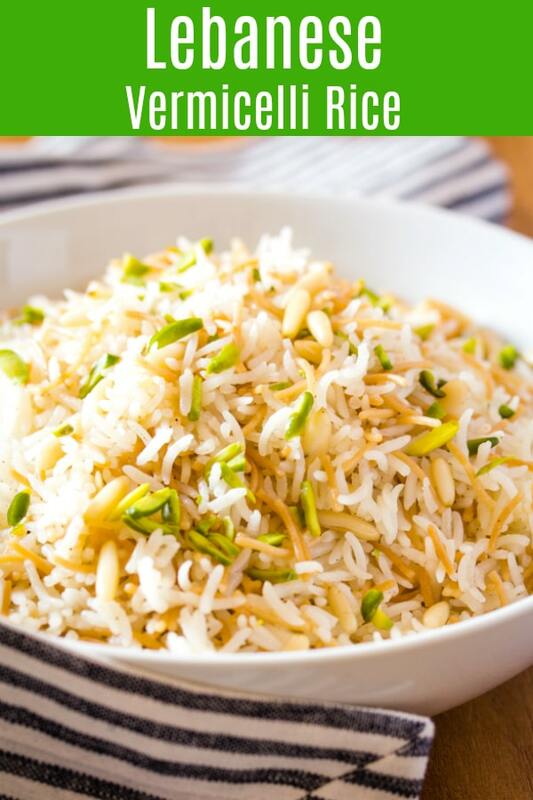 What is Lebanese Rice Pilaf? 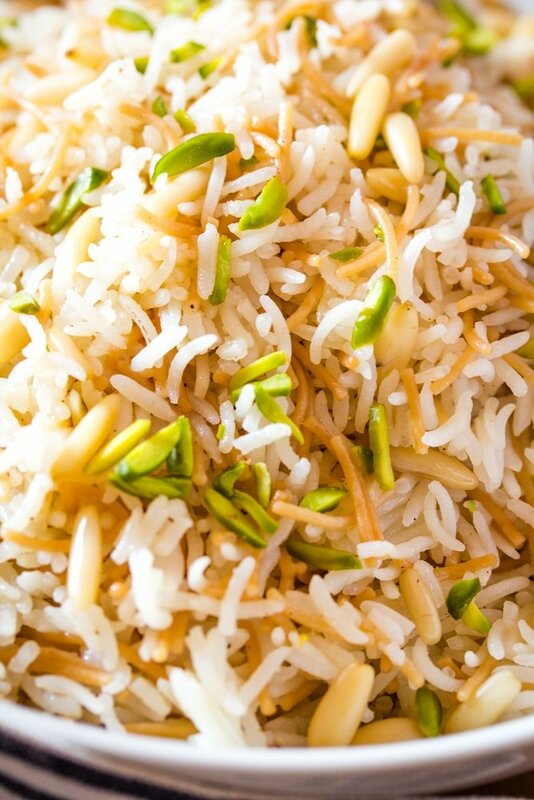 Lebanese Rice Pilaf (aka as Middle Eastern Rice or Arabic Rice) is a Middle Eastern staple that’s commonly served with main dishes. It only requires three ingredients: butter or olive oil, rice and vermicelli noodles. It’s got a subtle, nutty taste and goes well with meat dishes. But first, let’s talk about vermicelli noodles. What is Vermicelli and How Do You Cook it? Vermicelli is a type of thin pasta (thinner than spaghetti) and is made from flour. It’s usually used in desserts in India and Pakistan, such as sevyan (a vermicelli pudding, coming soon to the blog). However, Vermicelli is like regular pasta so it’s not sweet and can be used in savoury dishes such as this Lebanese Rice Pilaf recipe. This Lebanese style rice is so easy and delicious that it’s quickly become a staple in our home and I often make it with other Middle Eastern recipes such as Shish Tawook (coming to the blog this week). 1.) Start by soaking the rice in water for about 20 minutes or so. 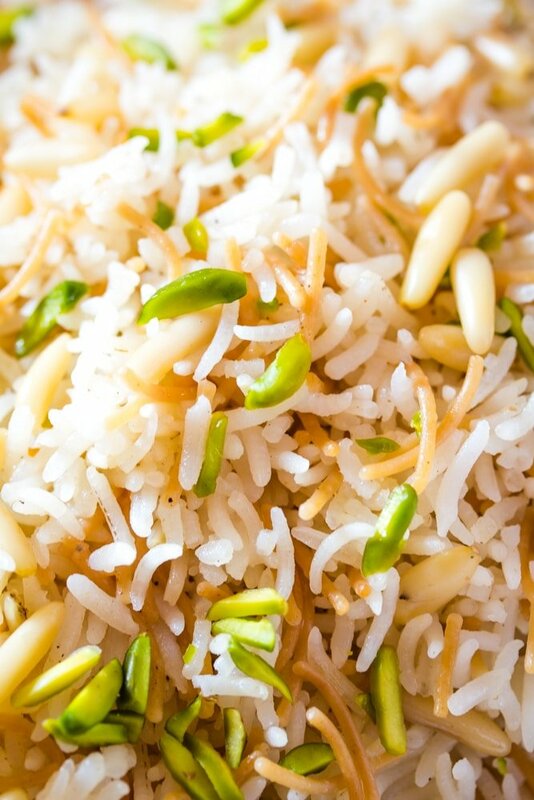 The best and recommended rice for this Lebanese rice is basmati. But you can use any long grain rice. I wouldn’t recommend short grain rice for this Lebanese Rice. After the rice has been soaked, drain the water and set aside. 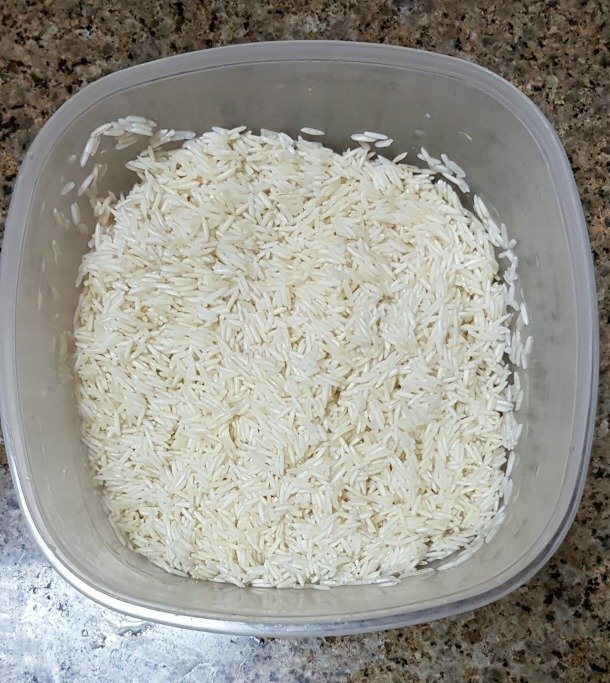 Below is a picture of the soaked rice after I drained the water. 2.) In a large pot, melt the butter or olive oil (ghee can be used as well) and fry the vermicelli pasta until it’s a deep golden brown. 3.) Add the rice and sauce for a minute or so (also add salt and pepper), and then add water. The perfect ratio for cooking rice is 1:2. 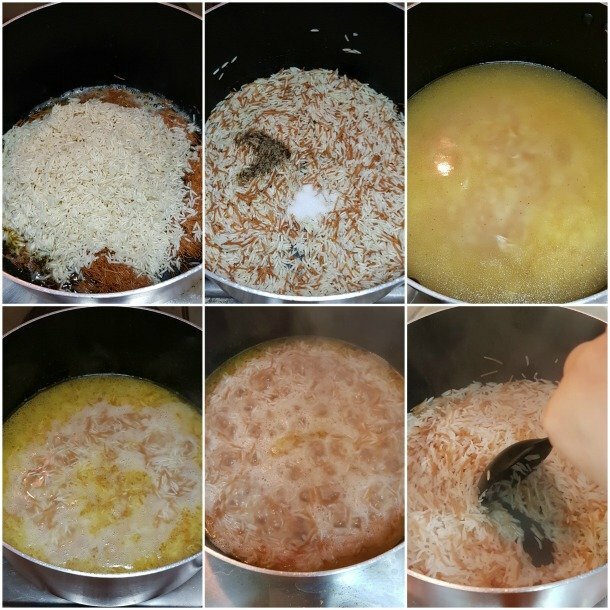 So if you’re using 1 cup of rice, you’ll need to add 2 cups of water to cook this Middle Eastern Lebanese rice perfectly. In this recipe since we are using 1 1/2 cups of rice we will need 3 cups of water. 4.) After adding the water, wait for it to come to a boil and let the water evaporate until there’s barely any left. Lower the heat of the stove and cover the pot. The rice will cook in the steam. 5.) After 5-7 minutes, remove from heat and take off the lid. Fluff up the rice with a fork. Top with slivered pistachios and pine nuts. 6.) Serve with your favourite Middle Eastern main. I do hope you try out this Lebanese Rice Pilaf, and pair it with the Shish Tawook recipe that I’ll be posting this week. 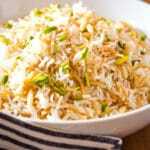 Lebanese Rice Pilaf with Vermicelli is a simple three ingredient Middle Eastern staple that is made with vermicelli pasta and cooked in butter or olive oil. 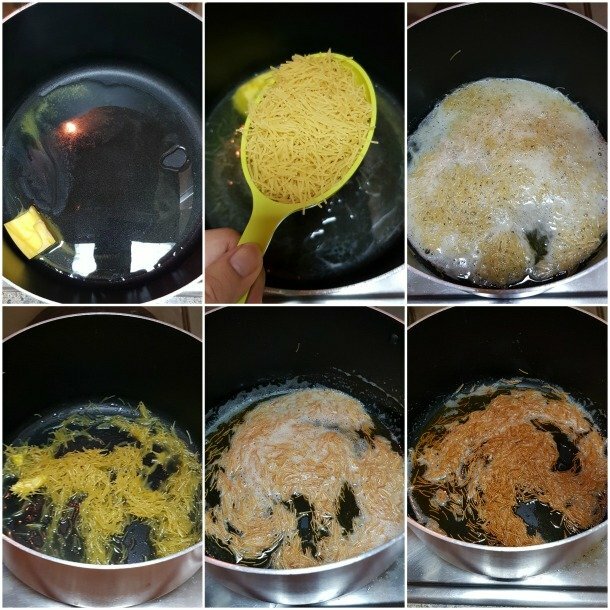 In a large pot, melt the butter and add the vermicelli pasta until it is golden brown. Vermicelli pasta goes very quickly from golden brown to being burnt. Refer to the pictures to see the exact golden brown colour we are aiming for. Add the rice, and stir it so that it toasts for a few moments (about 30 seconds). Then add the water, salt and pepper. Bring to a boil and let the water boil until there is little to no water left. See pictures below. Reduce heat to the lowest and cover. Cook for about 5-7 minutes. Remove from heat, and run a fork through the rice to fluff it up. Garnish with pine nuts and slivered pistachios before serving.